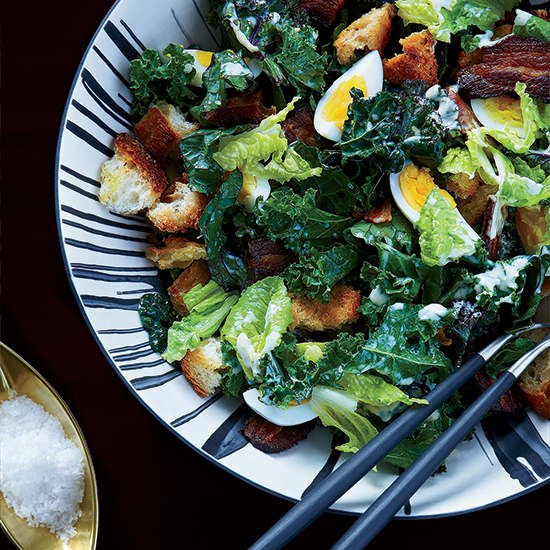 Like many chlorophyll-rich vegetables, kale is a wine killer, so it’s a brave, brave person who wants to pair kale salad with anything but fresh-pressed juice or coconut water. Sometimes, it’s not the wine that’s the problem. For your standard green salad with a tangy vinaigrette, most sommeliers reach for high-acid whites that have natural vegetal components, like grassy Sauvignon Blanc from the Loire Valley or peppery Grüner Veltliners. But raw kale is an especially assertive, sometimes-bitter and weedy-tasting green, and can challenge even the most vegetable-friendly wines. The solution, then, is not to switch up the wine but to adapt the salad. Your best bets will still be zippy white wines—you could go for something completely dry or look for a wine with a little sweetness, like off-dry Riesling. If you’re feeling adventurous, you could try a light-bodied, higher-acid, not-too-tannic red, like Beaujolais, which will pair well with the promiscuous ingredients without bulldozing your salad. And that’s much more appealing than beet juice, don’t you think?